Thousands of years in our past Light Elves fled to our world pursued by the Dark Elves. They stayed here until we began to use iron in large quantities. 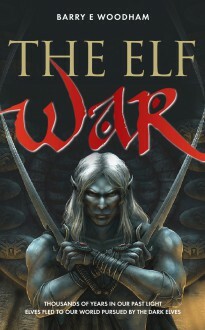 Keeping to the unwritten law that Elves do not harm Elves, they moved on, taking Neanderthal man with them when the Dokka’lfar opened a rift into our world. The Ljo’sa’lfar are pacifists and have managed to evade the Dark Elves who would indulge in their cannibalistic tendencies once they had the Light Elves in their power. Now after thousands of years have gone by the Dokka’lfar have found the Ljo’sa’lfar again, on another parallel Earth. They have been trying to pierce the poisoned brier, grown by the Ljo’sa’lfar for two centuries, inside the great gorge, entrance to the lands of the dinosaurs. At the center of this giant crater are the Ljo’sa’lfar who live inside a castle with small towns spreading down the mountainside. After getting the High King’s daughter pregnant, the punishment meted out to an elf called Peterkin sets in motion a chain of events that propels him into the annuls of history. He becomes the legend foretold by a dwarf dream-seer long ago after Abaddon the Dark Lord and his forces killed and ate a thousand dwarves before the brier closed.